Fact: According to the Ministry of Education and Training, from 1987-2009, the number of students was thirteen times higher, while the number of lecturers only tripled. Fact: The current average ratio of students to lecturers is 28:1. At the Ho Chi Minh City University of Foreign Languages and Information Technology it is 47.3/1, at the Ho Chi Minh City Open University 41.2, and at Hong Bang University 40.2/1. Fact: Newly recruited lecturers at the Ho Chi Minh City University of Technical Education are paid about 3 million VND ($154) per month in their first year. Fact: Most university graduates with “good” and “excellent” marks have no desire to become lecturers. Fact: The Ho Chi Minh City University of Technical Education planned to recruit 60 lecturers, but only 35 were selected from 110 candidates. Fact: 65 people signed up to participate in a selection process for the University of Finance and Marketing. Only 31 people actually attended the interviews and only six were chosen. This, of course, is one of the perennial and widely reported shortcomings of Vietnamese higher education. 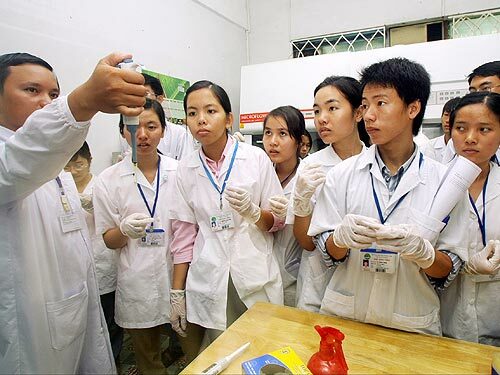 While there is a shortage of lecturers, qualified and otherwise, there are also many talented and dedicated faculty in Vietnam. The main reasons they are able to continue teaching are: 1) moonlighting to supplement their meager income; 2) a spouse who earns a good income; 3) investments and other sources of income; 4) they have no other viable career options. For those who are obliged to rely on option #1 to make ends meet and more, the emphasis is on quantity over quality. They are usually too busy teaching to revise syllabi as often as they should, update their knowledge, conduct research, engage in professional development activities, etc. Long-Term Solution: Tap into Vietnam’s rapidly expanding economy and unprecedented generation of income and wealth through personal and corporate income tax collection. Take concrete and measurable steps to minimize “slippage” (i.e., corruption). Phase in a series of sizable salary increases for faculty and administrators that are more in line with market-based pay. Design and launch a nationwide recruitment campaign as a first step in recruiting (and retaining) outstanding young faculty, including those who are overseas-educated. Also address issues related to working conditions, including hiring more staff and reducing class size. Click here to read Universities weep over shortage of lecturers (15.9.10). Thank you for helping to publicize the “faculty shortage” challenge facing Vietnam higher ed system. As you suggest, raising the financial rewards is essential for attracting and retaining prospective faculty members. While that may not come cheap, it can be much more cost-effective than letting the faculty shortage drives many more Vietnamese undergraduate students to seek overseas education than otherwise necessary. A business case can therefore be made to the MoET and policy makers to pursue this option. Thailand and Malaysia have been doing this for several decades such that most Thai and Malaysian students coming to the US now are graduate students, or at least upper undergraduates. Instead of simply recruiting from a very limited pool of master-degree holders, currently available, to serve as lecturers, Vietnam can recruit bright college graduates, attracted by better salaries and working conditions ahead (and a love for the teaching profession), and put them through master-degree programs to become lecturers within 2 years. Some of these lecturers can eventually be sent overseas for doctoral study. Such master-degree programs to educate lecturers can be economically set up jointly by some consortium of Vietnamese universities (e.g., those in the Mekong Delta through Can Tho U., those in Central Vietnam through Danang U., etc.). A few lecturer candidates each from several institutions in the same region can make such programs economically viable. Foreign faculty can be brought in to staff such programs on year-by-year basis. Foreign degree not needed (to save the time/cost of getting a reputable foreign university to set up such a program in Vietnam). National universities can grant such master degrees. The main thing is to get qualified faculty to participate. Vietnamese universities will have to collaborate with each other on this. And more time and money need to be spent on faculty development, not just on building modern campuses (nice to have but no quality education possible without qualified faculty). Perhaps as a short term band aid, a European style approach if bringing in faculty for 2-4 week courses could be used to attract visiting faculty and spread the word. I know that I would jump at the opportunity for a visiting position, as would many others. If managed well, the best visitors might potentially become hiring targets as part of your long-term recruitment strategy. One thing that distinguishes the Silicon Valley and the Rust Belt in the US is the business model of firms in the former region: “Think Big but Start Small and Scale Fast”. For Vietnam, thinking big is not an option because the challenges facing the country are enormous. In this regard I am heartened to read about the vision for education development (e.g., building model international university in Hanoi, Danag, HCM and Cantho, putting at least one into the top-rank list, and so on). The next choice, if one believes in the Silicon Valley business model, is to avoid the temptation of reliance on big, elaborate plan (“to match the big vision”) that cannot be implemented without massive resources, long lead time and a large cadre of experienced administrators, something currently in short supply in Vietnam (and even in many other countries much richer). Bill Gates, Steve Job and Jeff Bezos started Microsoft, Apple and Amazon in their garage and on the shoe string. Like these companies, and unlike industrial parks and manufacturing plants, education is an information- and knowledge-based business, it could and should “start small” and “scale fast”. Creative class scheduling can help. When it is summer time in North America and Europe, it is winter time in ANZ and vice versa. This makes it possible to draw faculty talents from these regions during “down” time (at a much lower cost than otherwise). Adding local faculty talents to this pool and one can have a viable faculty development program to educate master-degree lecturers as a start. Vietnamese institutions have to orchestrate this for their common good; foreign universities partners are unlikely to do so effectively for them. What is needed is someone with a passion for turning big visions into reality (rather than a grandiose plan on paper). That person should be living and working in Vietnam, if not for a life time then at least for many years so as to know how to work his/her way across administrative boundaries, what doors to knock on to get universities to pool their resources together, where to look for some seed money to get things started, and so on. Publicized vision for Vietnam future as a developed economy often mentions the year 2020. That is only a decade away. To get there fast requires a future to be built like the Silicon Valley rather than the Rust Belt. Of course, salary is also an issue at the primary and secondary levels.